The Story of Georgia Marble began about 600 million years ago at the bottom of a sea that covered most of what is now the forested slopes of the North Georgia Blue Ridge. 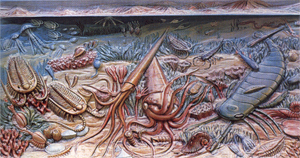 Over eons, the remains of primitive, calcium carbonate-secreting sea creatures settled to the bottom of the ancient sea. The layer of remains grew hundreds of feet thick over millions of years. Subsequently, the sea shallowed and the calcium carbonate deposits were buried under thousands of feet of muddy and sandy sediments whose pressure transformed the carbonate into limestone. About 450 million years ago, a series of early Appalachian Mountain-building upheavals buckled the limestone layer along with the enclosing rocks. Intense heat and pressure accompanying this deformation altered the rock into a unique crystalline marble. The Georgia Marble Company was founded on May 10,1884. From that day, the future of the marble industry in Georgia was destined for greatness. 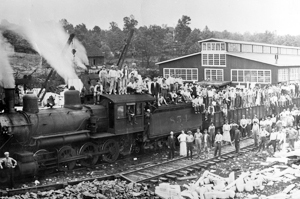 In September 1886, The Blue Ridge Marble Company was incorporated in Nelson, GA. The Blue Ridge Marble Company has, since the early days, specialized in Georgia Marble stone. 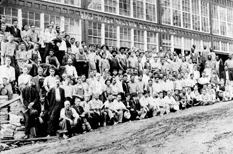 In 1917, The Blue Ridge Marble Company was bought by The Georgia Marble Company. From this point on, it operated as the structural division for Georgia Marble Company. By 2003, the plant had closed and moved to be combined with the memorial division in Tate, Georgia. In 2006, the doors reopened. The company was then named Blue Ridge Marble & Granite Company. The company added “Granite” to the original name of the company, since the structural division now also offers projects fabricated in granite. Today the company operates as it has since 1886, specializing in Georgia Marble stone fabricated by the most precise and skilled craftsmen in the business. Our skilled craftsmen, whose fathers and grandfathers cut and carved the marble before them, have the experience to execute any style, no matter how ornate.